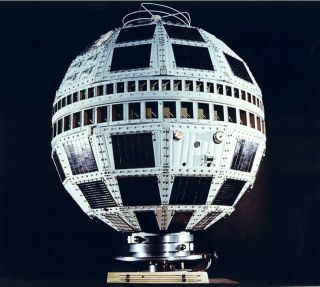 Image of the Telstar 1 satellite. Telstar was launched by NASA on July 10, 1962, from Cape Canaveral, Fla., and was the first privately sponsored space-faring mission. Two days later, it relayed the world's first transatlantic television signal, from Andover Earth Station, Maine, to the Pleumeur-Bodou Telecom Center, Brittany, France. Fifty years ago today, on July 12, 1962, the first ever live television signal was beamed across the Atlantic Ocean, ushering in a new era of communications that paved the way for the globally connected world we live in today. The Telstar 1 satellite, which became the world's first active communications satellite, launched on July 10, 1961 from Cape Canaveral, Fla. Two days later it made history by transmitting the first global television signal from the Andover Earth Station in Maine to the Pleumeur-Bodou Telecom Center in Brittany, France. The first images beamed to Earth in that broadcast included the views of the Statue of Liberty, the Eiffel Tower, remarks from President John F. Kennedy, clips from a baseball game between the Philadelphia Phillies and the Chicago Cubs, shots of the American flag waving in the breeze, and images of French singer Yves Montand. "Live broadcast of events happening throughout the world are taken for granted today, but 50 years ago transmissions enabled by Telstar captured the attention and imaginations of people everywhere," Wayne Clough, secretary of the Smithsonian, said in a statement. "The 50th anniversary reminds us how far we have come, and how much potential there is [in] the new era of digital communications." The "Telstar 50th Anniversary" symposium will begin at 1:30 p.m. EDT (1730 GMT), with a satellite television connection to the Pleumeur-Bodou Telecommunications Museum in France. During the live broadcast, Clough will be joined by French Ambassador François Delattre and the U.S. General Consul in France, Robert Tate. Historians and other experts from government and industry will also discuss the Telstar project and its global communications legacy. The event will also feature footage from the satellite's original broadcast in 1962. The Telstar mission was also the first commercial payload in space, and demonstrated the ability for information to be transmitted around the world using satellites. While the Telstar 1 satellite was only operational for a few months, it successfully transmitted a variety of signals from orbit, including television, fax, telephone, data and still pictures from several locations across the United States and Europe, Smithsonian officials said. Two weeks after it launched, the Telstar 1 satellite facilitated a multinational broadcast on July 23, which was carried by the American networks CBS, NBC and ABC, as well as CBC in Canada and Eurovision in Europe, Smithsonian officials said. The satellite was developed by Ball Telephone Laboratories for AT&T. The spacecraft helped engineers gain experience with satellite tracking, and also demonstrated the effects of radiation from the Van Allen belts on satellite design, NASA officials explained. The instruments on the sphere-shaped satellite was powered by solar arrays, with an onboard battery for backup. The Telstar 1 satellite was launched into low-Earth orbit, and was tracked by ground stations in Maine and France. These tracking stations had a large microwave antenna that could monitor the satellite during the roughly half-hour period of each orbit that passed overhead. Next generation communications satellites operated in a much higher orbit with the satellite's speed matching the Earth's rotation so that it appears fixed in the sky. While operational, Telstar 1 transmitted more than 400 telephone, telegraph, fax and television transmissions. The satellite remained functional until November 1962, when the spacecraft's onboard electronics malfunctioned due to the harsh radiation environment of space.